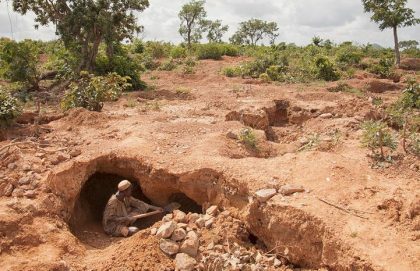 The Federal Government has announced the suspension of all forms of mining activities in Zamfara, and ordered all foreigners engaged in mining activities to leave the area within 48 hours. The acting Inspector-General of Police, Muhammed Adamu, who disclosed this when he addressed State House correspondents in Abuja on Sunday, said the order was part of measures to check banditry in the state. The IGP addressed the correspondents alongside the Chief of Staff to the President, Mallam Abba Kyari; Director-General of the Department of State Services (DSS), Alhaji Yusuf Bichi and Director-General of the National Intelligence Agency, Amb. Ahmed Rufa’i. “Mining activities in Zamfara and other affected States are hereby suspended with immediate effect. “Consequently, any mining operator who engages in mining activities in the affected locations henceforth will have his licence revoked. “All foreigners operating in the mining fields should close and leave within 48hours,’’ he added. The police boss assured the general public, especially those in the affected areas that the security services are doing their best to address the situation. He maintained that as part of sustained efforts to flush out, and permanently put an end to banditry and criminality in Zamfara in particular and the North West in general, the Police in collaboration with the military and other security services had commenced “Operation PUFF- ADDER”, a full scale security offensive against the bandits. “The operation is aimed at reclaiming every public space under the control of the bandits, arrest and bring to book all perpetrators of violence in the area and their collaborators, achieve a total destruction of all criminal camps and hideouts, mop up all illicit weapons fueling the violence and attain a full restoration of law and order in the affected communities. “Our commitment at protecting the sanctity of life and property is irrevocable, and we will not scale-down the pressure on the armed bandits until they are totally flushed-out,’’ he said.